You've found the “U.S. Welsummer Chicken Breeders” page here at Hobby Farm Wisdom! If this is the first time you have visited our site: Welcome! The Welsummer chicken is a breed poultry originating in Holland and known for its rustic red/orange color. It was developed by breeding a number of local breeds, including Rhode Island Reds, Barnevelders, Partridge Leghorns, Cochins and Wyandottes. Often times the media uses a Welsummer rooster to depict roosters in general, most notable being the Kelloggs Cornflake rooster. 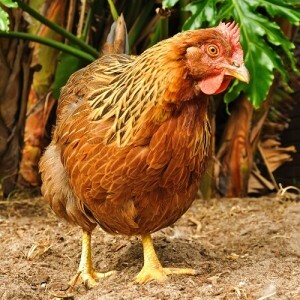 This breed of chicken is popular because of its good egg production, laying large eggs that are dark brown, often with dark speckles. They are excellent foragers as well, making them a good breed for free ranging. Welsummer chickens are also quite intelligent and friendly, however are not the most docile breed. Three varieties of the Welsummer chicken exist, including Silver Duckwing, Gold Duckwing and Partridge.